TRACKER (part of the Tantalum Corporation), the leading stolen vehicle recovery (SVR) provider, recently played a key role in helping Manchester Police recover a stolen Mercedes A45 AMG. Valued at £42,000, the vehicle was reported missing by a neighbour, who saw the burglary take place at the owner’s house in Broadheath. Luckily, the car was fitted with a tracking device and the silent signal emitted led police to the stolen vehicle. The Mercedes A45 AMG’s big price tag made it a key target for the thieves, who also stole a Rolex watch and other valuables when they broke into the owner’s home. Fortunately, once the tracking device on the vehicle was activated, police received a signal via TRACKER’s Mesh Network, and they were able to locate the vehicle whilst it was still on the move in Manchester. The Mesh Network takes advantage of vehicles fitted with TRACKER SVR devices, which in essence ‘listen’ out for reported stolen vehicles that have a TRACKER device fitted. This brings drivers together to create a UK wide network of ‘listening vehicles’ which can help pinpoint the location of a stolen vehicle fitted with TRACKER. Both drivers are totally unaware that the stolen vehicle has been identified by TRACKER’s Mesh Network. “Our close working relationship with the UK police forces means we are able to close the net on thieves who target high value vehicles,” explains Adrian Davenport, Police Liaison Manager for TRACKER. “Our unique combination of GSM, VHF and GPS technology means we can help police locate vehicles, even if they are hidden underground, in a garage or a shipping container. This entry was posted in Technology, Telematics and tagged GPS, GSM, Manchester Police, Mesh Network, stolen vehicle recovery, telematics, Tracker Network, VHF on April 19, 2015 by Tim Cosgrove. Copenhagen Airport is Scandinavia’s center for international air traffic and main transfer point amongst the many national and regional airports in Scandinavia and the area south of the Baltic Sea. To ensure maximum safety for all passengers, Copenhagen Airport operations regularly measures weather-related runway conditions, such as temperature and moisture, to store and analyze data and provide status information to incoming flights. However, measuring variables like runway traction cannot be accomplished using typical sensor solutions, and the VHF datalink being used by Copenhagen Airport’s Runway Observation System (ROS) provided poor coverage. For the system to be truly mission critical, the runway area coverage issues needed to be addressed. Copenhagen Airport implemented a sophisticated solution upgrade consisting of a specialized vehicle fully loaded with advanced detection instruments and a ruggedized, 3G Sierra Wireless AirLink™ MP880W mobile router operating over broadband HSUPA networks. The MP880W ultra-rugged in-vehicle GPS router comes equipped with an 802.11 b/g Wi-Fi chip to increase flexibility and enable mobile hotspots with enhanced WAP security. The MP880W also meets US Military and SAE specifications for vibration, shock, drop and more. With the specialized Saab 95 Combo vehicle driving on the runway at speeds of up to 90 kilometers per hour, the driver depends on the consistent, reliable broadband communication provided by the MP880W to detect and relay even the smallest details that can affect flight security. To view our range of Sierra Wireless Routers click here. This entry was posted in 4G, WiFi and tagged 3G, 4G, GPS, sierra, Thomas Lantz-Pedersen, wireless router on May 15, 2014 by Tim Cosgrove. An easier luggage process and less stress for the passenger thanks to two smart innovations using M2M technology. KPN, Fast Track Company and Air France/KLM/Delta Airlines are working on two innovations for easier tracking and tracing of luggage. An easier luggage process and less stress for the passenger thanks to two smart innovations on basis of M2M technology. KPN, Fast Track Company and Air France/KLM/Delta Airlines are working on two innovations for easier tracking and tracing of luggage. With M2M technology the position of just about every piece of luggage can be determined, anywhere in the world and at any time. From this basis, KPN, FastTrack Company and Air France/KLM/Delta Airlines started to make M2M applicable for the luggage processes in aviation. The results are eTrack and eTag, two applications that can be used both combined and separately. eTrack is a compact device that a passenger can put in his suitcase or travel bag and that continuously tracks its location via GPS and GSM. With a special eTrack app, one can track the luggage piece accurately, wherever in the world. eTrack uses the patented Auto Flight Mode, that meets all international rules for the use of GSM and radio signals on board of airplanes. Also, eTrack helps to prevent theft, by connecting the luggage piece to the owner’s smartphone via Bluetooth. As soon as the owner and the luggage are a certain distance away from each other – a distance set by the owner -, the alarm sounds on the smartphone. Besides, with eTrack it is very easy to check whether a luggage piece has been opened between check-in and baggage claim. eTag is an electronic luggage tag with two e-ink displays that can already be provided with the right barcode with flight information during online check-in. With this, the passenger arranges his boarding pass and luggage tag. This adds to the swiftness and efficiency of the luggage process and reduces waiting at the luggage drop-off. The traveler inscribes eTag with his eTrack, or directly from his eTrack app via Bluetooth. Also, the passenger and flight information is being stored on the built-in RFID-chip. Last mentioned technology is on the increase in aviation as a track and trace application in the luggage process. Air France/KLM/Delta Airlines, Fast Track Company and KPN expect to introduce eTag and eTrack this autumn. Samsonite will integrate the eTag and the eTrack in alimited edition suitcase. This entry was posted in IoT, M2M (machine-to-machine) and tagged Air France M2M, connected luggage, connected suitcase, Delta Airline M2M, eTrack, GPS, GSM, KPN M2M, Samsonite eTrack on March 28, 2014 by Tim Cosgrove. Navigation Solutions, a Hertz Company and developer of the award-winning NeverLost in-car GPS system, and Magellan, a leader of innovative GPS devices and content services for vehicles, fitness, outdoor and mobile navigation, announce the selection of Magellan as the exclusive manufacturer for the NeverLost 6 platform, Hertz’s next generation of connected services, which will be integrated into Hertz vehicles in 2014. In addition, Navigation Solutions has selected Magellan’s SmartGPS Eco for integration in Hertz vehicles in 2014. The Magellan SmartGPS Eco is the latest advancement in Magellan’s cloud based connected car services that delivers content saving drivers time and money, provide safer navigation and keep them informed with location and social content. The Magellan SmartGPS Eco is a cloud based platform aggregating location and social content. It leverages the cloud for location intelligence, and personalization. Drivers can choose the content they want, and it is all displayed simultaneously in a standard HMI. This entry was posted in Telematics and tagged bluetooth, Connected Services, GPRS, GPS, GSM, Hertz, Magellan, NeverLost 6, WiFi on January 19, 2014 by Tim Cosgrove. Co-Star have just launched a between series coaxial adaptor that has been designed to quicky convert an antenna terminated with an FME female connector to SMB female. SMB coaxial connectors are very common on DAB and Telematics equipment but most antennas for these types of applications are terminated with an FME female connector so Co-Star have developed the adaptor to enable engineers to quickly convert the FME female on the antenna to an SMB female without having to re-crimp and use additional tooling. The right-angle design of the adaptor means that there is less strain on the antenna and it also makes the connection into the equipment easier and more secure. ” We were approached by some of our OEM customers to come up with a solution to quickly change the termination on an antenna from FME female to SMB female for engineers installing DAB radio and Telematics equipment on site. The antennas are installed to enhance the customers DAB experience so the quality of the connector is vital to the overall performance. It can be complicated and time consuming for engineers to re-crimp the antenna on-site as special tooling is required , so Co-Star designed an adaptor that quickly screws on to the existing factory fitted connector and converts it into an SMB female without having to use additional tooling and testing equipment. We used the right-angle design as it puts less strain on the antenna and makes the connection into the equipment secure. 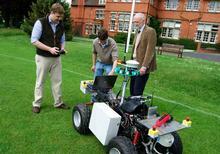 It has been a big hit with engineers as it allows them to quickly complete installations “. Co-Star have a comprehensive range of between series adaptors to enable quick and easy conversions on antennas for different applications. For more information please visit our website: www.co-star.co.uk. This entry was posted in In-Car and tagged antenna adaptor, co-star, costar, DAB, FME female.SMB female, GPS, Tim Cosgrove on January 2, 2014 by Tim Cosgrove. Farmers around the world will be able to improve their irrigation efficiency thanks to an autonomous vineyard robot developed at Harper Adams University. ‘Dionysus’ has been created to use thermal imaging sensors to detect moisture levels in grape vines. This data will then be used to inform farmers as to whether irrigation is required. 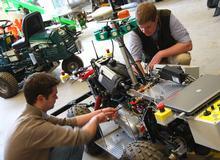 Three MEng Agricultural Engineering students at the university in Shropshire have designed and built the project – James Thomas, Kit Franklin and Chris White. 23-year-old James from Devizes in Wiltshire, said: “We had to select an appropriate vehicle to work in vineyards, in this case, a child’s quad bike. We then designed our own control systems to control steering, throttle and braking. Kit, 23, from South Cerney in Cirencester, added: “These systems are linked to a laptop running SAFAR agricultural robotic software, which takes readings from GPS and also a SICK laser scanner on the front of Dionysus. The team has been working on the project for the past few months, building on skills and knowledge developed during the five years spent studying at Harper Adams. Tasks were assigned to each team member to share the workload and to get to grips with the complex systems involved. Kit added: “This project has enabled us to develop our skills in areas such as mechanical engineering, electrical systems engineering and applications engineering. “As we’ve had to source suitable components from outside suppliers, there has been a lot of contact with professional engineers and industry experts. Dionysus is the first of many robotic/autonomous systems which are to be developed by the Harper Adams Engineering Department as part of the National Centre for Precision Farming (NCPF). 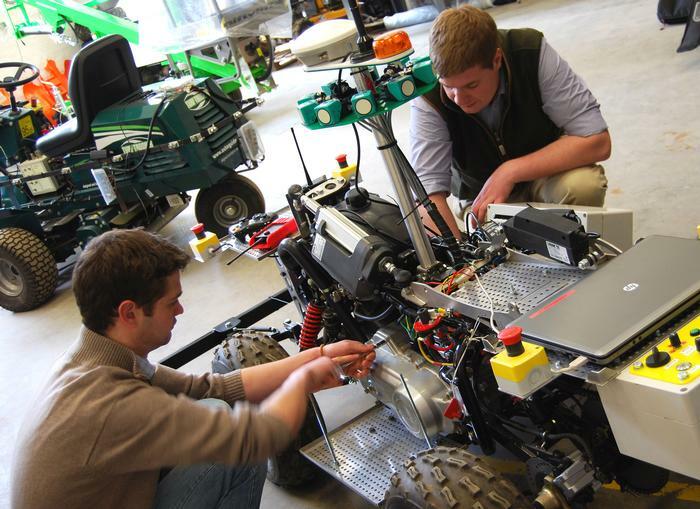 The NCPF promotes and evaluates the use of technology as a vital aspect of precision agriculture, building on Harper Adams University’s reputation as an innovator within engineering. This entry was posted in M2M (machine-to-machine) and tagged autonomous, Chris White, Dionysus, GPS, Harper Adams, James Thomas, Kit Franklin, NCPF on November 25, 2013 by Tim Cosgrove.